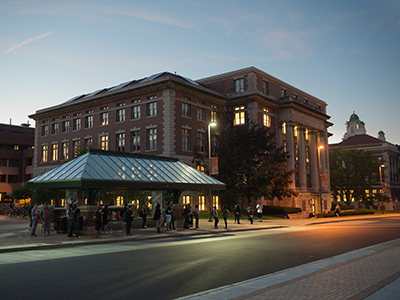 As part of the $100 million Invest Syracuse initiative to enhance the student experience, Syracuse University, in collaboration with Student Association (SA) and the Graduate Student Organization (GSO), announced plans for a new pilot shuttle to service Euclid Avenue. The new shuttle route will increase late night, off-campus transportation options. The Euclid Avenue shuttle route will operate during late-night hours on Thursday, Friday and Saturday, with stops along Euclid Avenue down to Westcott Street. SA leaders James Franco ’18, president, and Angie Pati ’18, vice president, say a strong partnership with University leaders and passionate student advocates made the new shuttle route possible. Working with SA and GSO, the Divisions of Enrollment and the Student Experience; Business, Finance and Administrative Services; and Campus Safety and Emergency Services outlined plans to launch the shuttle. The Parking and Transit Services team assessed routes in the east neighborhood and found opportunities to expand services. The Euclid Avenue shuttle route will operate during late-night hours on Thursday, Friday and Saturday, with stops along Euclid Avenue down to Westcott Street. The new route will include stops most requested by students and run at an increased frequency. Additionally, due to student interest, beginning in the spring semester, the Price Rite, located on Erie Boulevard, will be added to the East Campus Bus route on Saturday and Sunday. Additional details, including times and route information, will be posted on the Parking and Transit Services website in the coming weeks.